The LEGO group has started to come out with a full line of LEGO® Games. These games all have the base idea that players not only get to build the game that they will play but it also leaves room to change. Players can work on their changeable rules, rebuild the board and the LEGO Dice at any time they like. 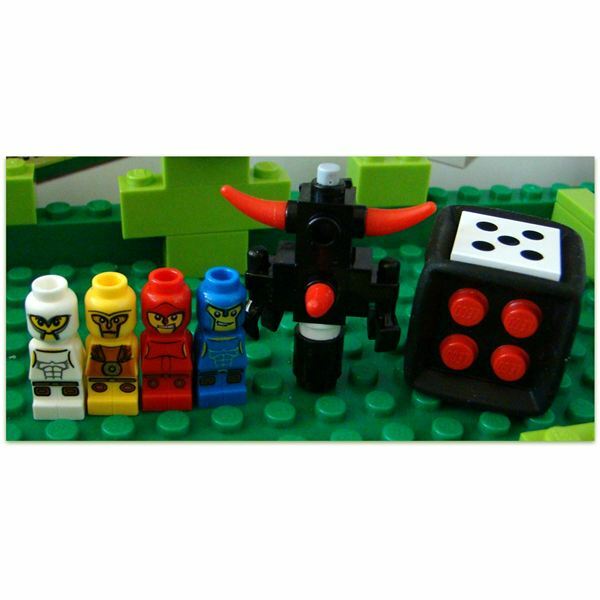 This changeability plays a major part in the LEGO minotaur board game. 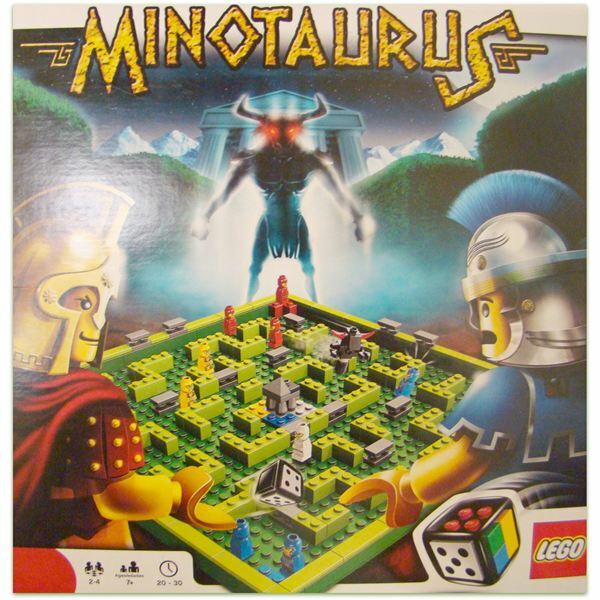 The classic story of the minotaur translates to family game night with the basic maze. Players get to work around the board and survive the mythical creature in much the same way as the original story. booklet. In the standard booklet, LEGO offers the basic rules for the game in French and Spanish along with an online offer for joining their LEGOclub for free. They also list other LEGO board games that are available such as Lava Dragon, Ramses Pyramid, Creationary and Lunar Command. Located on the inside of the box is a picture of how to place to built board into the box when done playing. Very family friendly and simple to follow through, straightforward enough for the kids to be able to build on their own. Just as the set up is easy to follow, so are the basic rules of the game. The game can be played with up to 4 players and in each case the youngest player goes first. The first player chooses a color and then rolls the dice, then moves the number of spaces in the roll. Each player begins with three heroes in their starting area but only one hero can move per turn. Once a player moves, they get to take a grey accent bench piece and place it on the board. The goal is to block up the maze and make it harder for the other players to reach their colored space at the temple. The minotaur itself can move up to eight spaces on any green space on the board away from the temple. When rolling the dice if it lands on black, the player loses their turn and the minotaur is moved. If it runs into a hero player in its travels it will be sent back to the temple and has to start all over again. This is also the case if a hero runs into the minotaur; both will be sent back to their starting points. The overall goal of the game is to get your players to the temple without running into the minotaur or getting blocked into the maze by other players. The player who reaches the temple by way of their colored area wins the game as long as they get each of their hero's to the temple area. For example, if player blue has two heroes at the temple and player red manages to get their third hero placed at the temple then hero red wins. Because the game is LEGO build-able, they state that it’s “Your game, your rules” which means that players get to change the rules of the game for the next round. The imagination is limitless when it comes to changing up the rules and when you’re playing with the family it can get really interesting. LEGO even has an online area through games.LEGO.com where you can go and submit your own rule changes while checking out some ways that other players have changed up their game. Players can opt to change one rule or all of the rules; some players have even switched to use the heroes as the monsters of the maze.